The reel is a fresh and responsive WordPress video theme from WPzoom developer club. This theme is specially designed to use for filmmakers and video professionals to showcase videos, audios, and launch of new movies. 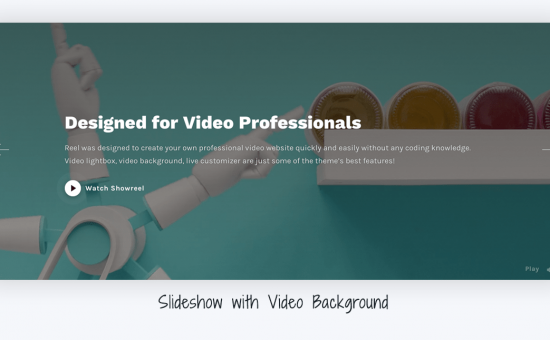 Since it has been built to use for Filmmakers, Reel WordPress Theme has built customizable options to display video lightbox, video background and live customization to design your own website without any coding knowledge. The design is very clean and responsive web designs that build by WordPress professionals. Moreover, Reel WordPress Theme is supported to work on all latest modern browsers and smartphone devices like iOS, Android, and Windows. Generally, Reel WordPress Theme can also be used for digital creative studios to create brand media and other digital platforms. It comes with plenty of amazing features to display the videos in contrasts ways. You can simply display video videos on your custom rows or display one static video instead, without navigation arrows. Additionally, you can also display Self-hosted videos can be added in the background. It is also supported by popular video channels websites like Vimeo, YouTube, MetaCafe & self-hosted videos. Reel WordPress Theme is also coming with visual video theme page builder plugin, where you can build your own web pages with custom options. Even you can build countless pages by using a simple drag and drop elements and widgets. This theme is also included with some pre-built page templates where you can import directly from the demo-content to your live websites by altering the contents and images/media. Reel theme comes with multiple styles of video portfolio templates to showcase of filmmakers and video professionals. You can create up to 4 columns features to showcase your videos, each of them as easily configurable to display the videos with lightbox effects. Reel WordPress Theme is a simple and powerful video-oriented website, hence you can build a professional video website with tons of features. It allows you to showcase and sell film release or film named products or digital products using a free WooCommerce plugin. This plugin allows you to create a to z features of e-commerce solutions. Even you can create online video subscription management for visitors to pay and use options for your videos. 3 Portfolio Templates and create a number of video columns from 2, 3 or 4. Lifelong free Reel WordPress theme updates!